Darius Pliskauskas will play for Peterborough Phantoms in the play-off finals. Peterborough Phantoms have received a huge boost on the eve of their English Premier League play-offs defence. Lithaunian international star Darius Pliskauskas has flown back into the UK to line up for the city side in Coventry this weekend. Pliskauskas had returned to his homeland for family reasons late last week and missed both legs of Phantoms’ quarter-final success against Sheffield Steeldogs. But the 35 year-old has declared himself available for semi-final battle against Guildford tomorrow (April 2, 5pm). Phantoms coach Slava Koulikov said: “It is essential we have a full set of imports for the play-off finals and we are all delighted that Darius has been able to return. 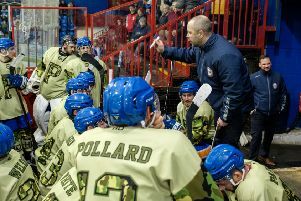 The winners of Phantoms’ clash against EPL Cup final conquerors Guildford will then go on to face either league champions Basingstoke or fifth-placed Milton Keynes in the play-off final on Sunday (April 3). Phantoms, who are due to complete their preparations with a practice session tonight, are without teenage talent Martins Susters who is on international duty with Latvian Under 18s.